After trying his hand at mainstream comedies with the likes of Pineapple Express and The Sitter, filmmaker David Gordon Green has recently returned to the land of indies, where he first made his name 15 years ago with Malick-esque surveys such as George Washington. (In between, he’s spent time directing and executive producing episodes of Eastbound & Down.) This new crop of old Green, however, has been marked by a sympathetic eye toward outcasts and failures—guys whose lives didn’t add up to as much as they thought they would. The bumbling dead-enders of Prince Avalanche and the struggling ex-con of Joe—featuring one of Nicolas Cage’s finest performances in too long—may be fools, but Green takes their misery seriously. Now comes Manglehorn, starring Al Pacino as the titular locksmith with nothing but time on his hands. Manglehorn lives a solitary life—his ailing kitty his only friend—but Green and first-time screenwriter Paul Logan hint at the world he once occupied. Periodically, the film will downshift so that a side character can tell a story about the Manglehorn they used to know: the father, the baseball coach, the loving grandfather. That we see little of the warmth or humanity these characters describe is Manglehorn’s great mystery: Where did that man go? Like Cage in Joe, Pacino’s appearance in Manglehorn adds extra layers of poignancy and grace to a past-his-prime protagonist. Once one of the most revered actors of his generation, the Oscar-winner has lately stumbled from one misfire to the next. (It’s not that inaccurate to suggest that his most memorable role in the last 10 years was in an Adam Sandler movie.) And so seeing him playing a man humbled by the cruel passage of time feels painfully close to self-critique. Maybe not surprisingly, then, Manglehorn finds the actor delivering an agreeably modest, empathetic performance. Too many years of hoo-ah overkill have stifled his light touch and effortless charm, replaced with hammy intensity and Scarface parody. But the Pacino on display here mostly puts aside the actor-ly embellishments. That’s a relief since the character often drifts toward “regrets…I’ve had a few” navel-gazing, leaving Manglehorn seemingly just the latest character drama in which an older man of no real importance looks back on an unremarkable life with vague sadness. Early in the film, we hear Manglehorn through voiceover write a mournful letter to his beloved Clara, a woman he misses terribly but whose identity remains a mystery to us for some time. This motif will continue throughout Manglehorn, as his emotional outpourings on the page clash with his guarded interactions with those around him, even his shy flirtations with a sweet bank teller (Holly Hunter). Only in brief scenes with his beloved granddaughter (Skylar Gasper) do we get a sense of the heart beneath the husk. The mixture of the odd and the antiquated gives Manglehorn some juice, but ultimately the film is a lot of clever touches in search of a stronger center and a better story. Manglehorn’s estranged son, a stereotypical Gordon Gekko-like investor played by Chris Messina, reenters his father’s life for the flimsiest of reasons. Manglehorn and the bank teller go on a date that results in some mild surprises. Overall, the film is a loose collection of incidents as our unlikely hero stumbles toward some sort of revelation about extricating himself from the rut he’s in. 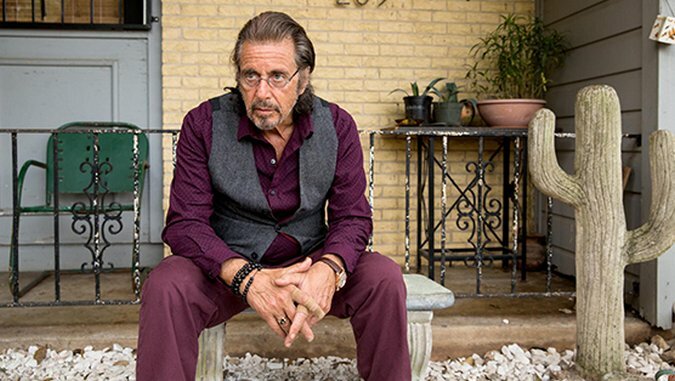 Pacino dials everything down, but at this stage of his career, it’s hard to envision him as someone as plainly ordinary as Manglehorn—the star persona takes over even when the actor tries to suppress it. Plus, the character simply doesn’t have enough dimensions. “I’m a tough man to be around,” Manglehorn warns at one point. Problem is, we don’t really see that in Manglehorn. If anything, he’s just not all that engaging enough to be around.